"The best no-bake chocolate cookies. They're not dry and gritty. It's the best!" Bring sugar, milk, margarine, and cocoa powder to a boil in a large saucepan for 1 1/2 minutes. Remove from heat and stir in oats, peanut butter, and vanilla extract until dough is evenly mixed. Drop tablespoonfuls of dough on prepared baking dish and let rest until cooled and set, about 50 minutes. 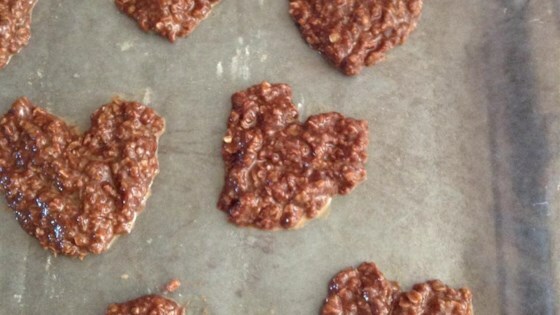 For crispy cookies, substitute 2 cups quick-cooking oats and 2 cups crispy rice cereal for 3 cups oats. YUM. I did add coconut (1 cup) and used butter instead of margarine. They set up better with butter. (let's face it, everything's better with butter) :) These are always a hit. They never hardened, just syrupy-like and mushy. cant get them off the wax paper without falling apart. I couldn't even get it out of the pan before it was crumbling up and falling apart.